Our Stories and Stone Kickstarter is closing in on its goal; we’re almost 95% funded with just over $300 to go! We’ve also just released the Somebody Will Teaching Album, doing sound editing to for the “If I Could Ask You Teaching Album”, and are getting ready for our upcoming concerts this August, so we’ve been quite busy. 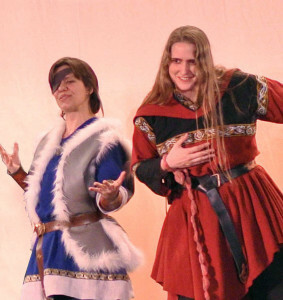 Trickster & King will be performing at Mythcon 46, in Colorado Springs between July 31-Aug. 3, with GOH Jo Walton, singing our Norse music accompanied by Jo’s Norse poetry. 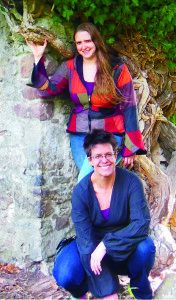 We’ll also be joining Jo and providing a song or two at the Tiptree Award Ceremony at Borderlands in San Francisco (3pm, Sunday August 9th) and at her reading at Powells, in Cedar Hills, Portland, (7pm Monday August 17th) where Ada will also read from her upcoming novel, Servants of the World. Trickster & King will also perform at Sasquan (Worldcon) in Spokane, August 19th-23th. The Kickstarter ends on August 15th, so by the time we get back from Worldcon we’ll know the final numbers and hope that we’ll not only be putting together backer reward packages, but starting up recording for “Friend in the Dark” in order to release that album as well. Thanks again for your support and we hope to see some of you this summer! Yesterday we launched a new Kickstarter to raise money to release two new collections of close harmony a cappella story and myth music. As I post this, we we’ve already reached $1635 of our $5,753 goal; thank you all for your continued support and enthusiasm! Uncategorized Comments Off on We’re Done! 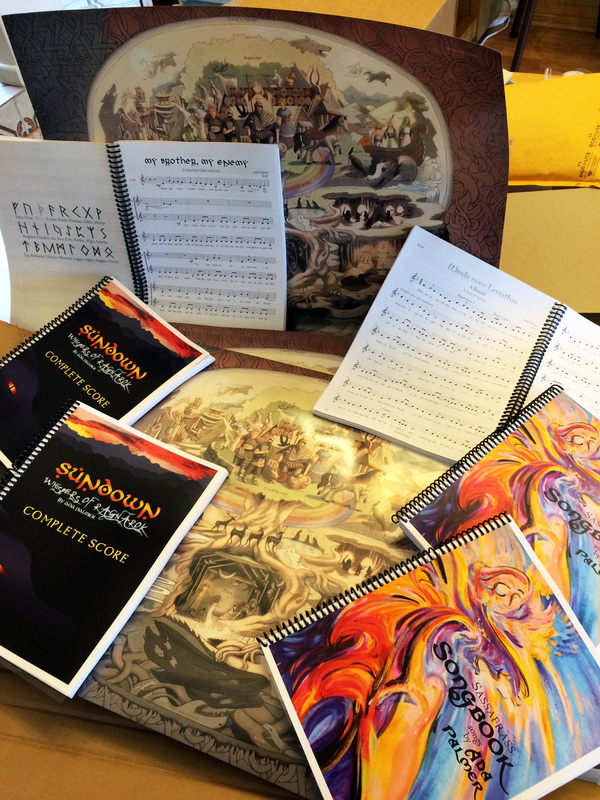 Our finished songbooks of both the Sundown music and our non-Norse music, and the poster of the Norse cosmos. It took us a long time, but we finally finished up our Sundown: Whispers of Ragnarok project, with the finished DVDs arriving in time for Balticon, two years after our 2013 performance. We’re proud and happy with how everything came out, and are excited that we can finally share the fruits of our labors with everyone. The Kickstarter rewards have been mailed out, so all of our backers should have received their rewards already, or should be receiving them soon. The CDs, DVDs, librettos, and songbooks have been available to pre-order for a while and are now officially for sale on Bandcamp. You can also now order the Somebody Will and the Norse Cosmos posters as well. We’ve also been adding teaching collections; we currently have teaching collections for “My Brother, My Enemy”, “The Futhark Song”, and “Abandoned”, and are working on finishing up additional teaching collections for other songs. Singing Norse music is even better when you sing by a fire. We’ve also been busy making new recordings of our non-Norse music which is not currently available except for now out-of-print albums and hope to release additional albums soon. Ada and Lauren have been performing more as the duo Sassafrass: Trickster and King and have been experimenting with performing duet versions of more complicated pieces like the quartet “If I Could Ask You”, which allows the audience to focus on two voices at a time and to hear parts of the song which aren’t the main focus in the quartet. Sassafrass: Trickster and King has two performances planned for this summer: we’ll be at Mythcon (July 31-August 3) with GOH Jo Walton and plan to have a reprise of the “Norse Hour” that we put on at George R.R. Martin’s Santa Fe theater last year. We’ll also be at Sasquan (Worldcon) in Spokane in August (19-23) and are looking forward to performing on the west coast. The CDs look and sound great! Ada Palmer and Lauren Schiller frequently perform together as the duo: “Sassafrass: Trickster & King.” We call it that because Odin and Loki are both tricksters, and both kings, in their way, so the double name invokes both characters. The next concert by “Sassafrass: Trickster and King” will be at George R. R. Martin’s Jean Cocteau Cinema in Santa Fe on June 22nd (7 PM), as part of the reading by Jo Walton. We’re very excited to be coming – Ada has been touring with Jo all summer and singing at her readings, but Lauren is coming for just this performance in Santa Fe. 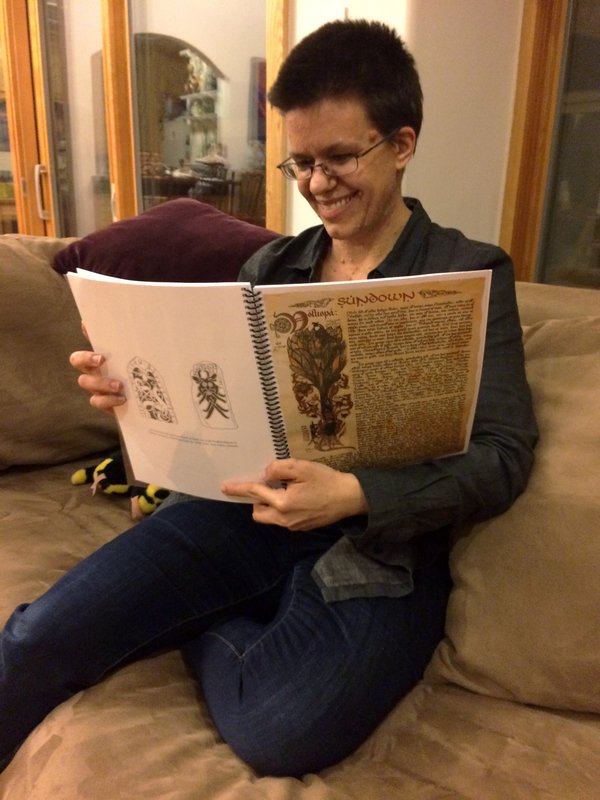 We will sing some pieces that go thematically with Jo’s new book My Real Children, and some Norse songs to go with her Norse-themed poetry, which she is reading. Should be quite the event! We will also perform at Loncon (Worldcon) in London in August. Uncategorized Comments Off on Happy Ragnarok, Everyone! 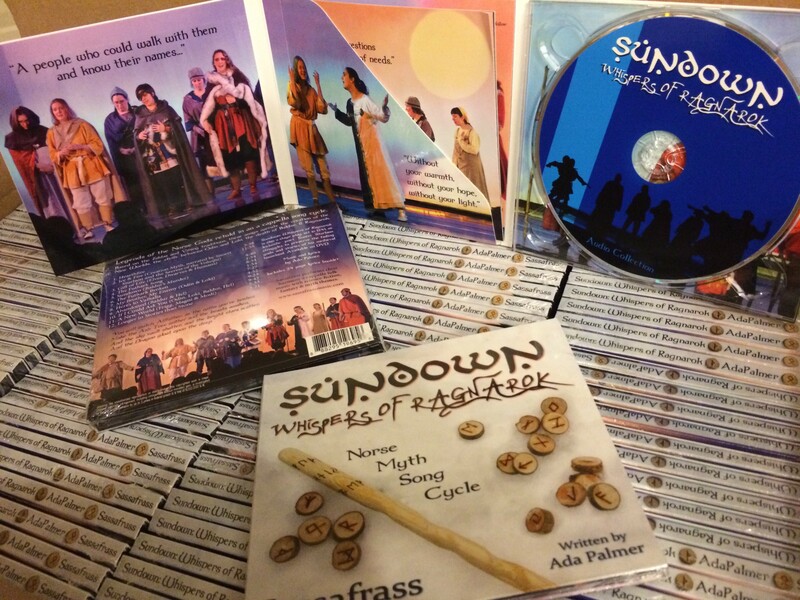 Meanwhile, production on the CD and DVD is proceeding nicely. Our video director is close to a final cut of the DVD footage, and expects the digital video to be finished in March. After that it will need to have menus, navigation and packaging design, but it is certainly on schedule for our projected June completion date. I have seen a few clips from the edited footage myself and they are very powerful, with the multiple cameras providing a great range of close-ups and full-stage shots. Audio recording is also in high gear. Polishing and finalizing the tracks after we record them is a slow process, so we have not completed any polished tracks since Longer in Stories than Stone which we shared in October, but we have now recorded the vast majority of the audio, with only a few smaller sections left to record. For the present, we’re deep in the sound editing gruntwork, and working slowly and methodically to make sure the tracks come out sounding their best. The largest and most complicated piece, Sundown, is in the very final phase of post-production, just undergoing final sound balancing to make sure every lyric track is clear and crisp. Many of the other songs are much farther from completion, but I’ve recently gotten to hear the raw recordings for Gift of Life, Here’s to Valhalla and the new five-part version of Hearthfire, and I am frankly blown away by how much clearer and richer they sound than any of our past albums. In particular, our new techniques are letting the different simultaneous lyric lines be much clearer, so you can finally actually hear all the words in all the separate parts in the big five and six line pieces. The exponential increase in effort and cost for these recordings is 110% worth-it! Uncategorized Comments Off on A busy October! It’s been a busy month! Ada and Lauren had a great time at Fencon in Dallas at the beginning of the month followed by an excellent house concert with Heather Dale and S.J. Tucker with local friends new and old. Both were fabulous and we hope to return to Fencon again as well as host more house concerts the next time the Heather Dale band or S.J. Tucker come through Texas. Lauren and Ada are also preparing to go to OVFF next weekend where we’ll be performing Ship of Stone in the Pegasus concert. (Lauren will also be pretending to be a drum set for another nominee.) We’re looking forward to seeing everyone there! If you won’t make it, don’t forget that pre-convention voting is open until midnight Pacific Time on Monday, October 21, 2013, so if you haven’t voted yet, go listen and do so soon! All of Sassafrass has been working hard on recording this month from our various locations; final editing is almost complete for the title song Sundown, and we’re making great progress with recording Hearthfire, A New World, Here’s to Valhalla, and If I Could Ask You. We have now completed and launched the two digital teaching albums which were promised as Kickstarter stretch goals. These albums take the songs apart and present each voice and combination of voices individually, so you can hear them alone, making it easier to understand and, especially, to learn these complex pieces. You can stream the music online for free, but each $5 album also comes with downloadable PDFs of the sheet music, lyrics sheets, a MIDI file for computer playback, and a PDF of notes by the composer discussing the piece and its sources. 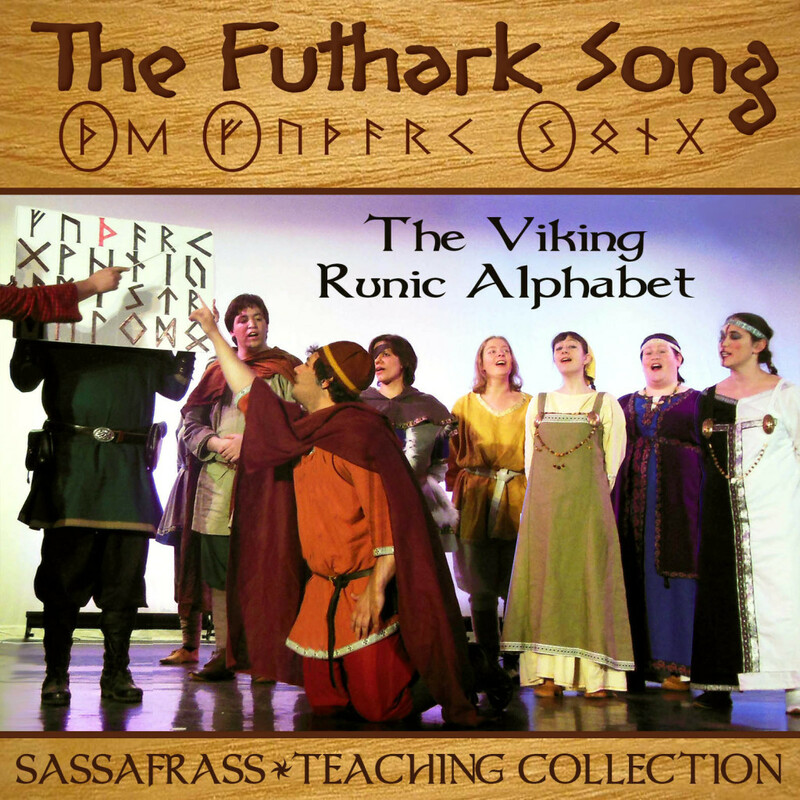 The Futhark Song Teaching Collection contains a whopping 32 tracks combining the different subsections of the harmony in all different combinations. This makes it easier to understand the modal harmony, and the explanatory notes discuss not only the origins and meaning of the runes, but give a lay introduction to modal music and discuss how modal elements are used in this and other songs in the Sundown collection. I heartily encourage you to listen to Longer in Stories than Stone again after reading the discussion of how its modal harmonics work. 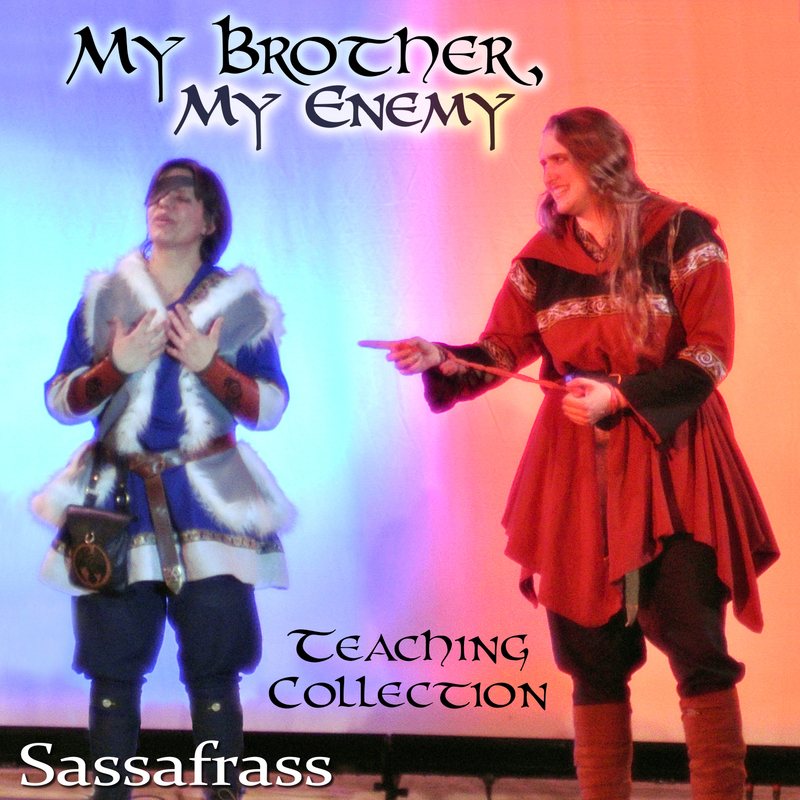 The My Brother, My Enemy Teaching Collection features one track with Odin’s voice dominant and Loki’s soft, and one with Loki’s voice dominant and Odin’s soft so you can follow each character individually, as well as the combined final recording (the same version that is on the Sundown album). Its notes discuss the historical sources, some of the nuances and references in the lyrics, and talk about how Loki and fire are connected, in the myths, and in the Sundown cycle. 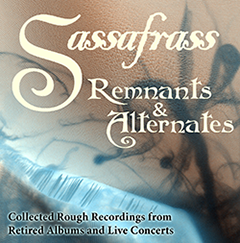 To thank the community for Sassafrass’s Pegasus award nominations, we are temporarily sharing the fresh-off-the-digital-presses final cut of the Sundown finale chorus “Longer in Stories than Stone.” It is available streaming only, and will remain online until the end of October, in celebration of the Ohio Valley Filk Festival (host of the Pegasus Awards.) This is the finished final track, of which a clip appears on the Sundown: Preview album, and the whole thing will be on the finished Sundown: Whispers of Ragnarok CD. This gives a real taste of the better quality recording we have been working so hard on, to make the finished CD a real step above our past releases. (Thank you again Kickstarter backers!) Enjoy, and remember to also scroll down to see the streaming video from Balticon! Sassafrass is delighted to announce that we have again been nominated for the Pegasus Awards for Excellence in Filking. 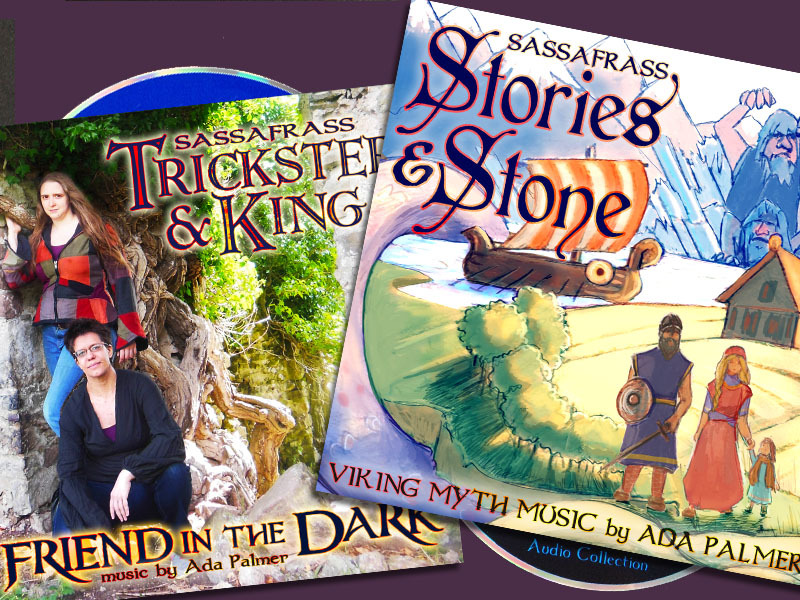 This year Sassafrass has again been nominated for Best Performer, and our composer, Ada Palmer, has, for the first time, been nominated for best Composer/Songwriter. The Pegasus awards are an exciting time, when new, exciting creations from around the filk community are gathered and shared. We enourage all our friends to visit the Pegasus website to hear samples of all the other great songs, composers and performers who have also been nominated. In addition, our recent performance at Worldcon was a great success. It meant an enormous amount to us to be able to bring Sundown to the unique audience which Worldcon attracts, and to share it with so many friends, old and new. Looking down from the stage and seeing the rapt and often tearful faces of friends was an overwhelming experience for us as we performed. We remain extremely grateful to the backers of our Kickstarter, without whose support we could never have brought the group to Worldcon. Concert at Fencon (Dallas), Saturday October 5th, preliminarily scheduled for 6 PM. Only two Sassafrass members will be present, Lauren and Ada, so we will concentrate on duet pieces and some of our rarely-performed two-part adaptations of more complex works. House Filk on Thursday October 10th, in College Station TX, hosted by Lauren and Ada and featuring Heather Dale and S.J. Tucker! We are delighted to be hosting these wonderful guest performers for our first TX area House Filk, and are talking with Heather about plans to experiment with some harmonies together. If you are interested in attending the event, please e-mail us or RSVP on our Facebook event page. Ragnarok comes to San Antonio! Uncategorized Comments Off on Ragnarok comes to San Antonio! 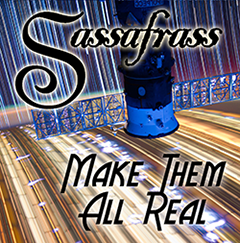 This weekend at the 2013 World Science Fiction Convention, Sassafrass will be performing Sundown: Whispers of Ragnarok for the second time ever! We hope you’ll be able to come see us at LoneStarCon 3 in San Antonio. Sundown will be from 2-4 pm on Saturday in Ballroom A. You can also see several members of the group in other programming at Worldcon, including a special panel on the making of Sundown! 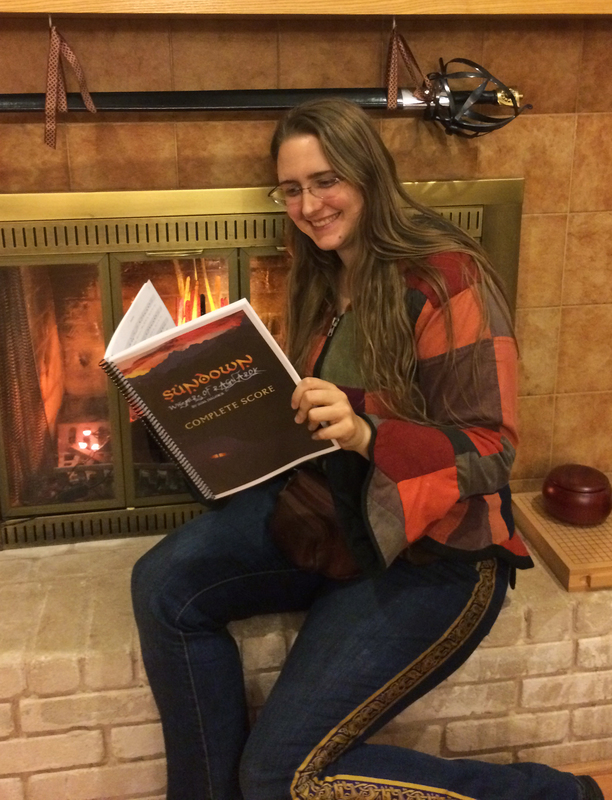 You can hear us discuss “The Making of the Musical Sundown: Whispers of Ragnarok” at 11 am on Sunday in Conference 12. This performance would not have been possible without the support of our fans, so thank you so much for bringing us to Worldcon. Speaking of the support of our fans, for those of you who’ve been waiting for news of the CD, don’t worry. We are working hard on recording so that we can get it to you! The recording process is slow, but steady, and we’ll be keeping you updated as we complete songs and make progress on the DVD and CD. Thanks again to all our fans and to LoneStarCon 3 for featuring us. See you in San Antonio!